Announcement Visit saaridesign.com Getting married? Please contact us and we will be happy to put together a wedding package for you for your stoles and hand muffs. I SHIP INTERNATIONALLY Every item is made at the time the order is placed. There is no pre made stock sitting on the shelf. These are quality handmade luxury items. I am a stay at home mom of 2 beautiful little guys, and I love to sew. We have been in business since 2001! Every item is made by me, so it can be customized any way you like. If you would like something larger, or a different color or fabric, just let me know. 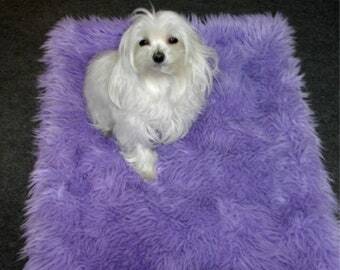 Luxurious Faux Fur Dog Bed Cats love them too! This was perfect for someone who always has cold hands. Proudly made is the USA since 1999! I started this business sewing necessities for my little ones. The fabrics and prints I chose were a big hit so I decided to start a business to keep me home with the kids instead of going back to work. Fast forward 16 years and we are still stylish and in demand. We still make things for the little one but my love of everything soft and furry also expanded my business in the Home Goods section. The faux fur goods have also landed us in the middle of Bridal world. And we are happy to be involved in all 3! If it is warm furry and soft we love it <3 And all our faux furs are machine washable in cold. Air dry. We LOVE special request. We want to see YOUR dream become a reality. Thank you so very much for supporting my dream of staying home and raising my children. You are welcome to change the color combination of the item if available. See a blanket you love but hate black? Feel free to request another color. ***All items are machine washable. The throws and all faux fur items need to be washed in cold and hung to dry. Since each item is made to order, this is a custom order, please read the listing carefully as returns are not accepted. All sales are final. Saari Design has been in business since 1999 and we stand behind our product...PLEASE READ EACH LISTING CAREFULLY. Our sizes and measurements are exact and we are not responsible if you measured incorrectly or did not understand the measurement listed. Please ask ALL questions relating to sizing, etc. before making your purchase. Saaridesign.com accepts all major credit cards as well as ATM. Paypal is preferred payment method. You do not need a Paypal account to pay using you credit card. If you use Direct check out to pay please be aware that payment will not be received by me for up to 7 days. This may delay shipping the item to you until payment is actually received. Paypal payments will ship within immediately or within 3 days. Please contact me if you would like to place an order using a money order. *** most items shipped within three days but please allow up to 7 to 10 business days for item to be made and shipped. We LOVE large orders and wholesale orders!